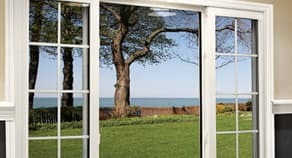 From their easy-to-use design to their energy efficiency and maximum ventilation, sliding windows are a beautiful and valuable addition to your home. Stanek® vinyl sliding windows feature slim vertical lines for a clean, elegant look and are available in four different sliding combinations. Sliding windows, or gliding windows, have sashes that glide left or right in either direction in a single frame, which allows for easy use. At Stanek, we offer two types of gliding windows: two-lite and three-lite sliding windows. The two-lite sliding window has two independent sashes that slide left to right, which allows for maximum ventilation and makes cleaning a breeze. The three-lite sliding window configuration, typically a picture window, has two independent sashes on either side of a fixed center sash. Sliding glass windows are often found in rooms where an unobstructed view of the outdoors is desired or where maximum ventilation is needed. Since they are easy to open from left and right, sliding windows are commonly found in spaces that are difficult to reach, such as above the kitchen sink or behind a soaking tub. They are also ideal for openings in which the width is greater than the height. At Stanek, our windows offer many features and benefits. Stanek sliding windows lift out easily, which makes cleaning simple. They are also perfect for large spaces due to their wide design. In addition, each of our sliding glass windows features a low profile, double cam lock that provides you and your family with security and peace-of-mind. Looking to lower your energy bills? Check out Stanek Comfort-Gard® high-performance glass. At Stanek, our sliding windows feature dual brass rollers and fully integrated life rails that ensure a smooth operation every time. These windows are structurally reinforced with Fibermax®, a composite material exclusive to Stanek which provides structural integrity for the window. We also offer FlexScreen®, the world’s first flexible window screen, for all of our double-hung and sliding windows. It is virtually invisible, giving you an unobstructed view of the outdoors. We also offer a variety of configuration and sizing options to perfectly fit your space. Energy efficiency is crucial; that’s why we offer multiple energy-efficient glass options to choose from. We will also match your windows to the color and style of your home with our color and design options, which give your home a personal touch. 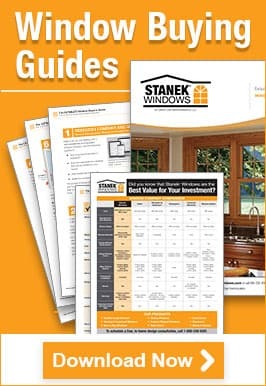 Would you like to learn more about Stanek brand sliding windows? Schedule a free, in-home estimate, or give us a call at 1-800-230-8301 for more information.